I have to admit it: I like heat. I do not like many of the things that go with it, like blaring car stereos and people swearing in the streets. But I get a kick out of a hot day. And today was one! I got up late because I could not sleep in the heat. I took a shower and drank a cup of coffee and then my friend Michelle and I went walking around the park. That was one hot walk! We did twice around. After that I took another shower and then I went to the Clinton-Bailey Market. It was like the Deep South. White men, black men standing around together, fanning themselves. Heaps of zucchini and eggplant and peppers. You know it is summer when you are called "Mama." That happened to me! One farmer is packing up his truck -- it was late by the time I got to the market -- and he calls over to me, "Hey, mama, gettin' it all packed up, lock, stock and barrel." I love that old phrase lock, stock and barrel so I started laughing. He called out: "Thanks for the smile!" I picked up peaches and tomatoes and corn and cucumbers and a basket of green beans for my mom. Then went to my mom's and we lay around on the porch and drank beer and ate watermelon and listened to "Porgy and Bess." It was being broadcast live from the San Francisco Opera. 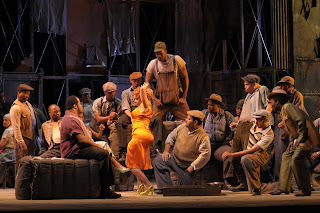 My mother was telling me about when "Porgy and Bess" came out, in 1933, she was a little girl and still she remembers it, the melodies drifting from the car radio. She was in her older sister Adelaide's car, with Adelaide's husband (or boyfriend, or whatever he was at the time) and they would be listening to "Bess, You Is My Woman Now." Imagine when that was pop music! 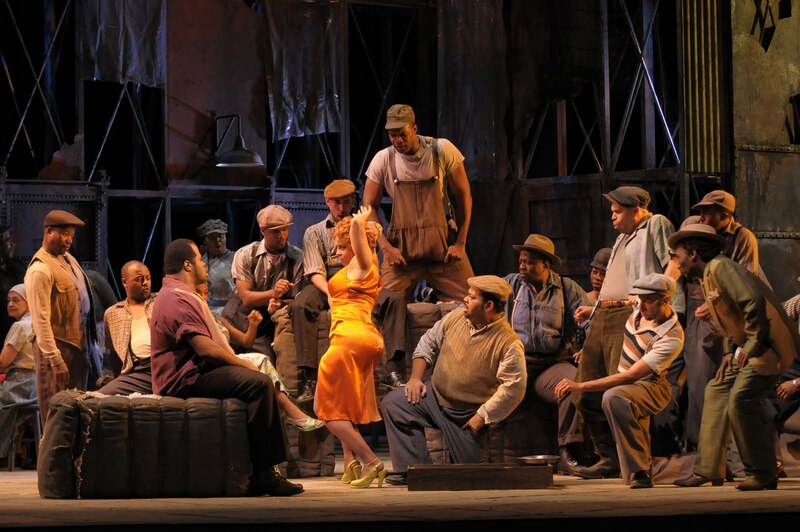 My mother has a great ear for music and she recognized right away, even as a little girl, how wonderful "Porgy and Bess" was. That is a scene from "Porgy and Bess" up above. We used to talk to Al Tinney about George Gershwin. Al Tinney was a pianist in Buffalo, in case you are new to this Web log, and when he was a young teenager he had the job of being George Gershwin's rehearsal pianist, when Gershwin was readying "Porgy and Bess" for Broadway. Al Tinney was a very gifted jazz pianist who gave Charlie Parker his first job in New York. When I was in California with Leonard Pennario, my friend Charlie who is a big jazz fan called and said, "If only you could have done this with Al!" Meaning, take down his memories. I said, "But Charlie, Al wasn't a talker!" Leonard was a talker. At least to me, he was. But Al was not. Reminds me, I should make the case in the book that Pennario is the greatest Gershwin pianist. I believe that and I would not be alone in that opinion. There is a thought for a blazing hot day! Anyway, this day has been sort of sweet and slow. Hot days tend to be very loud days so that is one thing that I will not miss when it is cooler. But I will miss this easygoing feeling. Unfortunately, legal hold ups between the Gershwin estates, Goldwyn Pictures, and the politically correct feelings by surviving cast members mean this movie may never be released again in a form the general public can obtain (much like "Song Of The South"). I know of only one near mint 35mm print. It is owned by Ken Kramer in Burbank, California. Mark, we should go to Ken Kramer's house, and watch his near mint 35 mm print!